Meet the women behind the statistics! 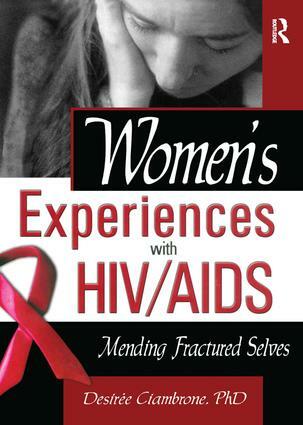 Women's Experiences with HIV/AIDS: Mending Fractured Selves examines the impact of HIV/AIDS on women, the fastest-growing subgroup of the HIV-infected population of the United States. Based on interviews with HIV-infected women, the book gives voice to their experiences. This powerful text offers a firsthand view of what it is like to live day-to-day as a woman with the added burden of HIV/AIDS. Women's Experiences with HIV/AIDS is a powerful and compelling look at the day-to-day struggles of 37 women infected with HIV. Their stories detail their ongoing efforts—with varying degrees of success—to come to grips with the disease as they try to rebuild their lives. Through qualitative analysis, the book demonstrates the importance of relational resources, such as AIDS activism, support groups, and social support. It also addresses potential problems for women associated with caregiving and presents ethnographic research findings on the complex factors that affect women with HIV (socioeconomic status, sexual preference, lifestyle differences). A rare look at the experience of women infected with HIV (most studies focus on male samples), Women's Experiences with HIV/AIDS is an invaluable academic resource as a course supplement in the fields of medical sociology, women's studies, public health, and community health, and is an enlightening read for everyone interested in HIV/AIDS research.